Well I finally got around to getting him into Maya as a lower poly model. Here he is so far. Still painting a few things and i gotta down res all the shackles still. 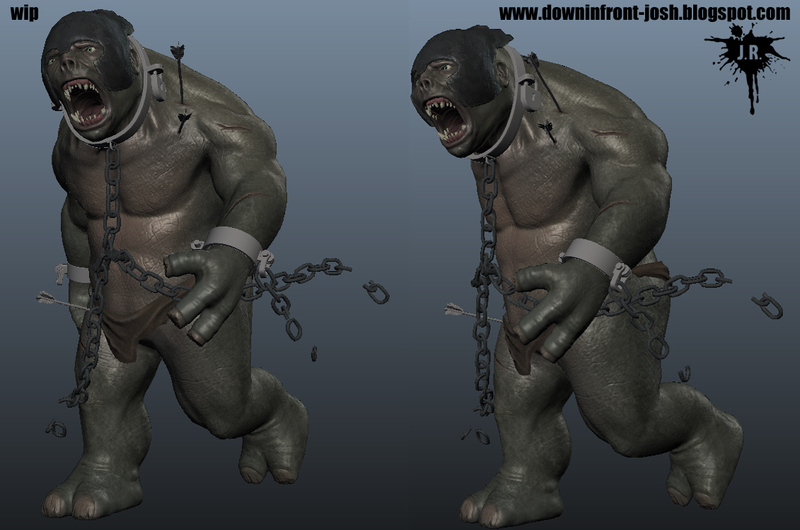 I like how i can sculpt him in a matter of hours but transferring maps and getting all that sh*$ to work takes days. How annoying. 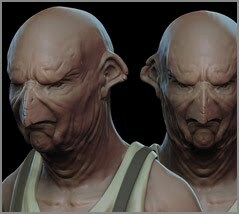 I've been using the new Zbrush UV unwrap feature almost exclusively and for the most part I'm pretty damn impressed. I'll be using this a LOT in the future. Pretty crazy though how many applications i use just to do 1 character now. Mudbox for painting Maps. (SOOOoo fast. amazing). Xnormal for simple 2d height map to NM creation. Maya for... well just about nothing because it's worthless. I guess to create a base mesh if i don't use silo and also to display it in the end. Although I'll probably use a free game engine i found for my final shot. So yea... i guess I dont need it for much.